The next meeting: How well do you know your city? It’s Coventry Society’s annual QUIZ NIGHT Monday, January 9 at 7.30pm at the Whitefriar’s Olde Ale House, Gosford Street Make a team of 4 with friends or join a team on the night. Admission and entry free with prizes. After a series of talks with Council Coventry Boys’ Club opposite. Both officials the Society has been found a of these organisations have been site near to the city centre where a consulted and are keen to be small pocket park can be created as involved. Coventry University with its part of Coventry 2012. large population of students is also We first mooted the concept in the just a short distance away. hope that a community project would So the initial idea can be very much a transform one of two derelict sites off community based project in what is Corporation Street. For various otherwise something of a backwater. reasons it wasn’t possible to progress There are various options we need to these and instead a derelict area at consider when it comes to a design Potential: (above) the area of land is next door to the Whitefriars Lane has now been and of course a key element of the pedestrian subway linking with Whitefriars; identified and offered. project will be the involvement of the (below) children enjoying a pocket park The creation of small open spaces two adjacent organisations. away from the bustle of city centre It’s envisaged that the landscaping streets is a concept that’s been would provide an interesting facility around for years. 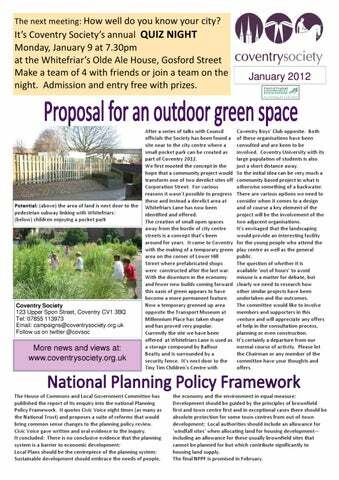 It came to Coventry for the young people who attend the with the making of a temporary green play centre as well as the general area on the corner of Lower Hill public. Street where prefabricated shops The question of whether it is were constructed after the last war. available ‘out of hours’ to avoid With the downturn in the economy misuse is a matter for debate, but and fewer new builds coming forward clearly we need to research how this oasis of green appears to have other similar projects have been become a more permanent feature. undertaken and the outcomes. Now a temporary greened up area The committee would like to involve Coventry Society members and supporters in this opposite the Transport Museum at 123 Upper Spon Street, Coventry CV1 3BQ Tel: 07855 113973 venture and will appreciate any offers Millennium Place has taken shape Email: campaigns@coventrysociety.org.uk of help in the consultation process, and has proved very popular. 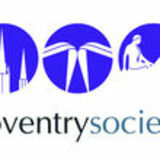 Follow us on twitter @covsoc planning or even construction. Currently the site we have been offered at Whitefriars Lane is used as It’s certainly a departure from our normal course of activity. Please let a storage compound by Balfour More news and views at: the Chairman or any member of the Beatty and is surrounded by a www.coventrysociety.org.uk security fence. It’s next door to the committee have your thoughts and Tiny Tim Children’s Centre with offers. A meeting of the city council’s planning committee on January 12 will decide the fate of An appeal has been lodged against the the old Cheylesmore pub site ‐ which has been derelict for several years. Council’s refusal of planning permission Supermarket chain Asda, which now owns the site, has submitted two alternative designs for Peugeot’s storage and distribution for a new local store which they say will complement their existing larger store at warehouse on Plot 1 at Lyons Park. Whitley. One proposal envisages a “modern” functional design whilst the other is The proposed building, that would labelled as “art deco”. operate 24/7, would clearly have a An alternative scheme for the site, submitted by the Cheylesmore Community considerable impact on the surrounding Association, proposes a new Community Centre which is intended to replace the existing residential area and Green Belt at facilities in Poitiers Road. Coundon Wedge. Formal consultation on the Asda proposals ended on December 29 but comments on the In the outline planning permission for Community Centre application can still be made until January 9. Lyons Park the Council had already The planning committee will consider all three options at the same meeting ‐ which is stated that large warehousing on Plot 1 open to the public and scheduled to begin at 2pm on Thursday January 12 at the would not be suitable, yet Peugeot’s Council House. Ask at reception for details of the committee room. John Marshall current proposal is even higher and Details of all applications can be found on the council website – search for the Asda larger than the outline plans show. proposals by using reference numbers FUL/2011/2171 and FUL/2011/2170 and for the This development would clearly be better suited to Peugeot’s former site Community Centre proposal using reference number OUT/2011/2244. at Ryton.